Vancouver, British Columbia--(Newsfile Corp. - January 23, 2019) - Goldsource Mines Inc. (TSXV: GXS) (OTCBB: GXSFF) (FWB: G5M) ("Goldsource" or the "Company") is pleased to report a new high-grade discovery from the first two diamond core hole results based on the ongoing exploration program at the Salbora target ("Salbora"), Eagle Mountain Gold Project ("Eagle Mountain" or "Project") in Guyana. 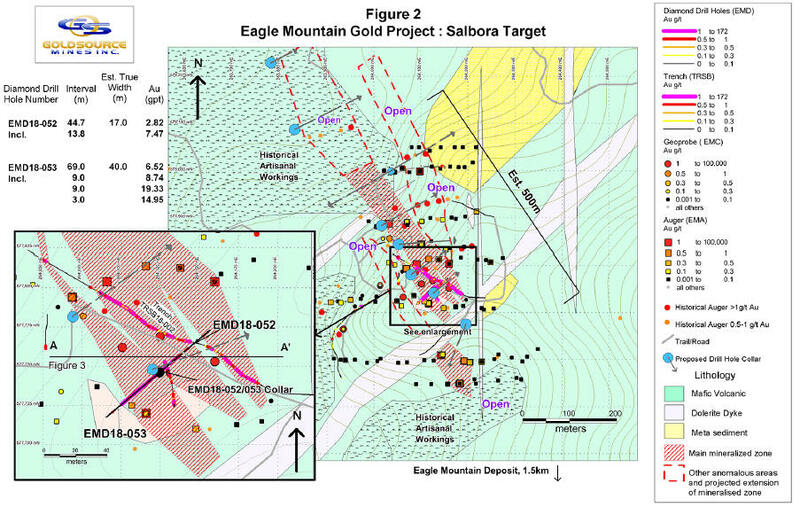 Salbora is located approximately 1.5 kilometres northwest of Eagle Mountain. The Company's first two diamond core holes include EMD18-053 with 40.0 metres (est. true width) grading 6.52 grams per tonne ("g/t") gold ("Au") and EMD18-052 with 17.0 metre (est. true width) grading 2.82 g/t Au. Results from these near-surface diamond core holes show high-grade gold mineralization below the previously announced surface trench, TRBS18-002, which returned 123 metres (horizontal width) grading 1.92 g/t Au (see news release dated May 24, 2018). The estimated mineralized footprint at surface, determined by initial work to date, is 500 metres long, 50 to 100 metres wide, unknown depth from surface, and open in all directions (see attached Figures). Step out diamond core drilling is planned at Salbora in H1, 2019 to help further define this high-grade discovery. Yannis Tsitos, President, commented, "These first deeper drill holes at Salbora improve our understanding of the previously announced high-grade results, which included trenching and shallow sonic core drilling. Surface projection of gold mineralization to depth is apparent and remains open in all directions. 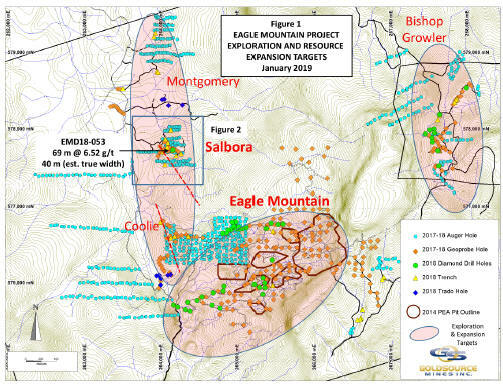 These diamond drilling results indicate the potential to delineate a near surface, wide, high-grade gold deposit at Salbora which would expand the current resources at Eagle Mountain. Hole EMD18-053 is the Company's best drill hole to date on the Project. The Company is starting a step out diamond drilling program on 50 to 100 metre centres along the suggested strike of Salbora to test continuity of high-grade mineralization and further increase our understanding of the overall grade and size of this discovery." *Cutoff grade of 0.3 g/t Au. Holes EMD18-052 and 53 were drilled from the same collar position in opposite directions. 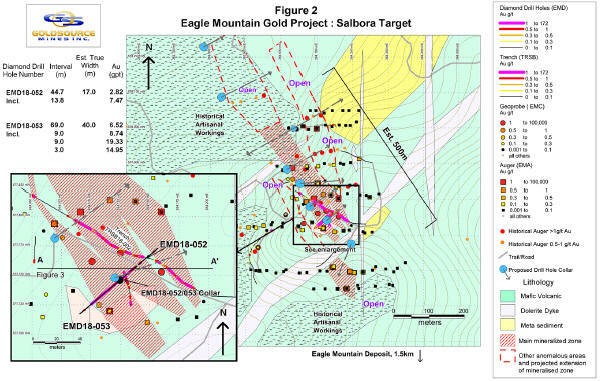 The combined estimated true width of the gold mineralization from both drill holes appears to be 57 metres, assuming a near-vertical mineralized dip. Both holes intercepted near surface high-grade gold mineralization in saprolite and hard rock. Estimated true widths of mineralization are preliminary and more drilling is required to confirm current geologic assumptions as presented in the attached Figures. The Salbora discovery is located within a northwest-southeast regional structural trend several kilometres in length. 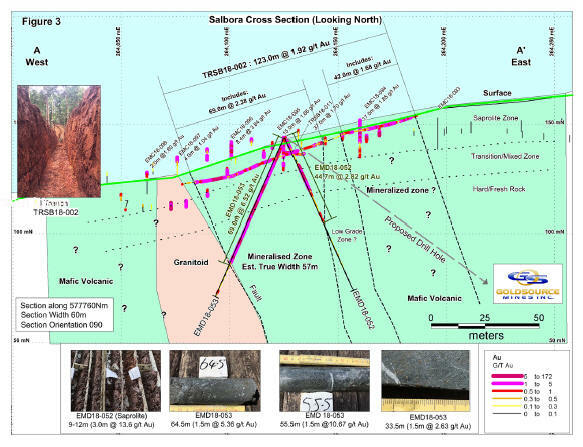 Locally, the high-grade mineralization at Salbora is found within a wide near-vertical shear zone hosted in Guyanese Shield greenstones of metavolcanics and metasediments, intruded by granitoids. Gold mineralization is associated with quartz veining, stockwork and breccia within the shear zone and appears to generally correlate with disseminated sulphide (primarily pyrite) content within the hard rock, which is mainly mafic volcanics. At Salbora, saprolite is an estimated 15 to 35 metres thick. To date, Goldsource has completed two diamond core holes (173 metres) as presented in this news release, 14 sonic shallow core holes (161 metres), 113 shallow auger drill holes (436 metres) and 11 horizontally and vertically sampled trenches (928 metres) at Salbora. Please refer to 2018 news releases dated May 24, July 12, and October 25 for previous results on Salbora. All results with gold mineralization are considered near surface and several drill holes ended in gold mineralization. Several additional auger and sonic core holes are pending results and will be reported, once they are received and compiled. Step out diamond core drilling of approximately 1,500 metres (10 to 15 holes) is planned for Salbora in H1, 2019. The Qualified Person under National Instrument 43-101 - Standards of Disclosure for Mineral Projects for this news release is N. Eric Fier, CPG, P.Eng, Executive Chairman and Chief Operating Officer for Goldsource, who has reviewed and approved its contents. This news release contains "forward-looking statements" within the meaning of Canadian securities legislation. 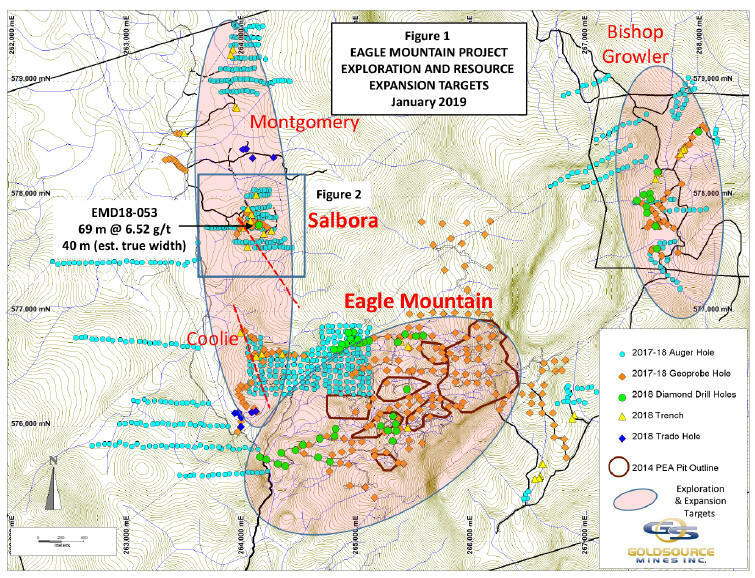 Such forward-looking statements concern Goldsource's strategic plans, timing and expectations for the Company's exploration and drilling programs at Eagle Mountain; and information regarding high grade areas projected from sampling results and drilling results. Such forward-looking statements or information are based on a number of assumptions, which may prove to be incorrect. Assumptions have been made regarding, among other things: conditions in general economic and financial markets; accuracy of assay results and availability of mining equipment; availability of skilled labour; timing and amount of capital expenditures; performance of available laboratory and other related services; and future operating costs. The actual results could differ materially from those anticipated in these forward-looking statements as a result of the risk factors including: the timing and content of work programs; results of exploration activities and development of mineral properties; the interpretation of drilling results and other geological data; the uncertainties of resource estimations; receipt, maintenance and security of permits and mineral property titles; environmental and other regulatory risks; project costs overruns or unanticipated costs and expenses; availability of funds and general market and industry conditions. Forward-looking statements are based on the expectations and opinions of the Company's management on the date the statements are made. The assumptions used in the preparation of such statements, although considered reasonable at the time of preparation, may prove to be imprecise and, as such, readers are cautioned not to place undue reliance on these forward-looking statements, which speak only as of the date the statements were made. The Company undertakes no obligation to update or revise any forward-looking statements included in this news release if these beliefs, estimates and opinions or other circumstances should change, except as otherwise required by applicable law. Neither TSXV nor its Regulation Services Provider (as that term is defined in policies of the TSX-V) accepts responsibility for the adequacy or accuracy of this release.